If you ever wanted to know that how was the experience of your product or service when your customers used it? But people are not always fond of giving long reviews. They don’t have much time. So, in this case, you can use the star rating functionality on your website. Because of it, you can get the quick reviews in ‘stars’. Yet, it is not easy to do the programming part for adding & enable this functionality to your website. That’s why I’ve listed some of the primest jQuery rating plugins which will ease your work in this case. If you add them to your site then all you have to do is to customize its settings according to your needs & enable it. Then, your work is done! Even you can do a lot of customizations on them such as changing the icon to the image according to your wish, icon size, number of icons in a single rating tab & many more. See! That’s a lot of features! In place of icons, you can also simply display the numbers from 1 to any number or some options like good, poor, average, etc. This is how you can do a huge variety of stuff with them. So just read out this article & choose the best plugin according to your needs. You may also like to read more jQuery plugin blogs which might help you in your work. JM-Rating is jQuery plugin through which one can convert any input tag into a nice rating element. In order to do it, this plugin allows using some features such as glyphicons, font awesome, SVG or any kind of images. Apart from it, you can style your rating component with CSS files editing. Also, this rating plugin uses only a single third party JS lib. This rating plugin has a basic plan which charges $7. It has another plan charging only $35 for more features. It is way too easy to use & can be integrated on any kind of website. You can customize its many options according to your needs from its dashboard as well as a coding section. You can edit some of the elements for more accuracy such as starCount icon type, tag, rate icon, unrate icon, component class & many more. It is one of the easiest for implementing the rating functionality on any webpage. For displaying the rating functionality, you can add stars & images of any size, margins, color etc. Well, it does not calculate the total rating of the product or item but only provides you the ratings shared by the customers or users. Ultimately, it will help you in your business. This jQuery rating plugin has a regular license charging $5. It also has an extended license which costs $25. You can set how many stars or rating icon you want to display on the user end. If you are adding your own rating elements then you can set them to read-only mode. So, others will not be able to copy your style. Also, this plugin is touch friendly. That means, people can also rate it through touchscreen devices too. This jQuery plugin works by modifying a standard select field into a rating element or widget. It is also easily styleable with the use of CSS manipulation. You can choose to select any kind of rating style such as 1/10 rating, square box, horizontal rating & many more. As the rating widget includes the anchor elements, so you can press tab or shift-tab in between the elements & then press on entering button on the keyboard to select a rating. This plugin is an open-source product. Through this plugin, you can set two types of the rating system: animated figures and numbers rating. Apart from simplest one, you can also try out the reversed & vertical rating style which can attract more visitors to your website. Also, it allows you to add your own text for rating purposes such as poor, average, good, excellent, etc. With features such as fractional star fill, RTL input support, etc, here comes Bootstrap Star Rating plugin. It uses Bootstrap markup as well as styling options which you can override by any other markup language such as CSS. You can convert any kind of HTML input into a star-based rating control system. Even its newer version comes with the support of multiple SVG icons which can truly transform the rating style on your Website. When the form/page is reset, the ratings are revised to the default values at every time. Well, this plugin offers the clean & scalable vector icons for the stable display of ratings across all the devices. Also, you can optionally use the Unicode character set to overrule the rating symbols. Rateit.js is an enhanced jQuery plugin with lots of customization & tweaks. 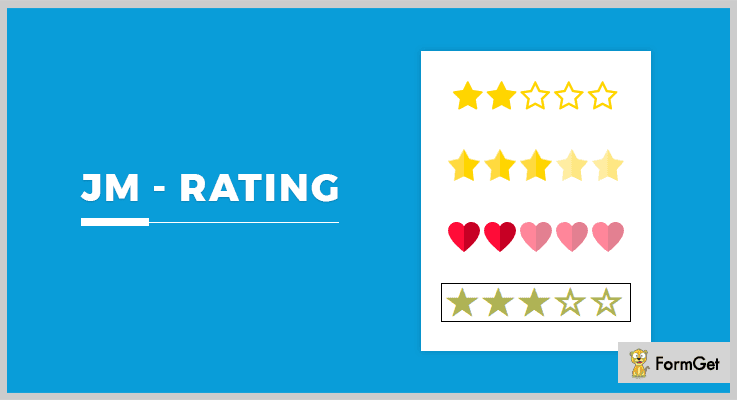 You can implement a rating functionality on your site with so much ease. All you have to do is to swap out the images & change some CSS styling functionalities. Even this plugin also allows adding as many rating stars you want to. So you don’t have to worry about any boundations. This rating plugin does not charge any amount for the usage. It uses some progressive enhancement functionalities which can truly represent your rating widget in a much better way. This rating plugin is way too easy to use in such a way that even a human who has no programming knowledge can also use it. It comes with full documentation guide. So you don’t have to worry about how to use it. So above are some of the best jQuery rating plugins which you can integrate with your website. After enabling them on your site, people can rate your products or services with so much ease. That’s how you’ll get to know the quality of your product. Well, some of these rating jQuery plugins are free while others are paid. They consist of multiple numbers of customization facilities. Even you can add your own images or icons in place of the default one to make your rating style unique. All you have to do is to try them out & get to know about the views of your customers towards your service. You can also comment below if you have any queries or suggestions with respect to this article. After all, we’d love to help the future billionaires.